A pioneering waste industry mobile phone App has attracted over 2000 downloads since its launch in September 2011. Cleansing Service Group (CSG) introduced what was then the industry’s first ever App to give users a rapid way of categorising their waste by accessing the European Waste Catalogue (EWC) codes while on the move and whatever their location. Mike Wilson, CSG’s group business development manager said: “Making the EWC Codes quickly accessible on mobile phones has proved to be a valuable tool to people responsible for categorising wastes. 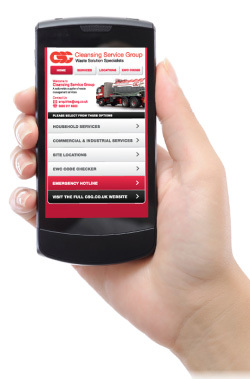 The free App, available on Windows, Android, Blackberry and iPhone platforms, also gives instant access to details of CSG’s services, 22 UK locations and 24 hour hotline. CSG, which has its headquarters in Fareham, Hampshire, is one of the UK waste industry’s front-runners. The company has developed a number of pioneering waste treatment and recycling processes and operates a nationwide network of specialist treatment facilities for hazardous and non-hazardous solid and liquid wastes.